Waggies! Our fave hardy palm at Xera. The fronds on this slower growing tree are stiff and tidy and have none of the drooping filaments on the branch tips that the species T. fortunei possesses. To 12′ tall in 7 years. A very clean and tidy looking palm with a distinct asian look. 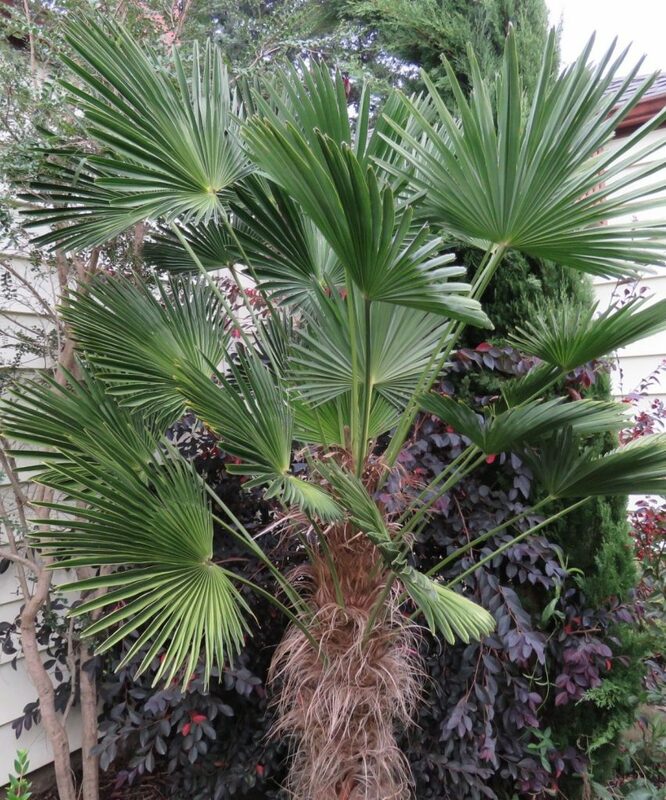 The fronds are even finely outlined in white hairs…more definition for this stately plant. Grows about 2′-3′ a year if well watered. You really can’t water Trachycarpus too much in the ground, it just makes them grow faster. Same wooly trunk as the species. Waggies are recommended for windy cold areas as they are not affected by those conditions. Fantastic cold hardiness not suffering damage until temps dip below about 5ºF. This is a great palm for colder gardens and tolerates quite a bit of shade. Always looks it’s clean best.